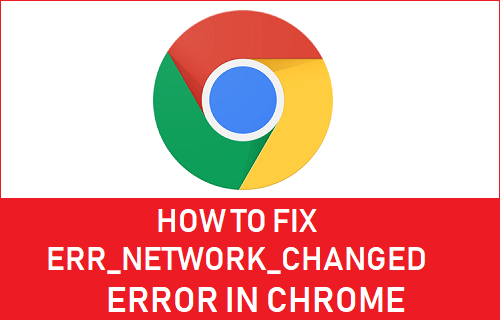 If you are unable to access the internet due to ERR_NETWORK_CHANGED Error in Chrome, you will find below a number of methods to fix Err Network Changed Error in Chrome browser on Windows computer. The Network Changed Error in Chrome browser appears with an Error code ERR_NETWORK_CHANGED and an error message reading “Unable to access the network”. As you can see, the error code ERR_NETWORK_CHANGED broadly points to some kind of network connectivity issue on your computer and does not provide any specific reason for the problem. 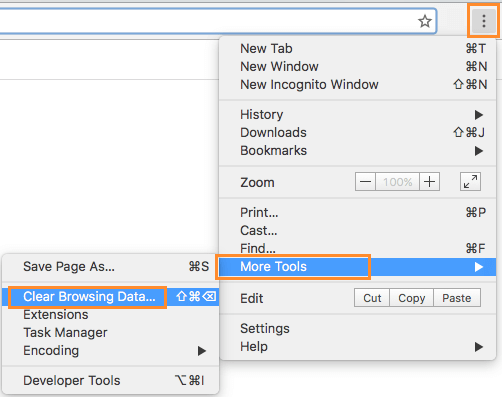 Hence, any of the following network troubleshooting methods might help in fixing Network Changed Error in Chrome browser on your computer. Starting with a simple fix, simply restart your computer and see if it helps in fixing the problem. If you are still unable to access the internet, unplug your Modem/Router from its power source (Wall Socket) and wait for 60 seconds. After 60 seconds, start the Modem/Router and patiently wait for all the lights to turn green. Now, try to access the webpage and see if you are still getting Err Network Changed Error in Chrome browser on your computer. 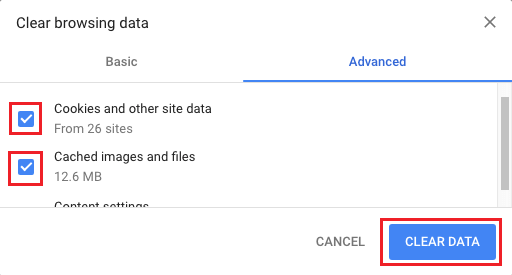 Click on the 3-dots menu icon located at the upper-right corner of your screen, click on More Tools > Clear Browsing Data… option in the drop-down menu (See image below). On the next screen, clear Browsing History, Cookies/Site Data and Cached Images/Files by clicking on Clear Data button. After this, try to access the webpage and see if you are still getting Err Network Changed Error in Chrome browser. 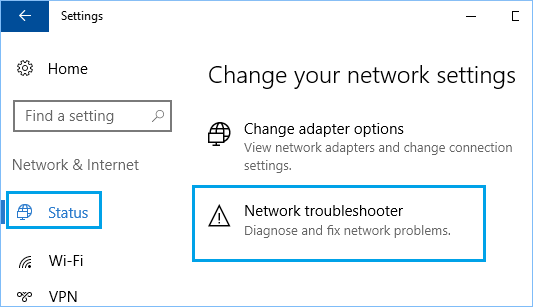 Since the problem is most likely related to a network connectivity issue on your computer, you can try the in-built Network Troubleshooter in Windows 10 to help you fix the problem. On the next screen, click on Status in the side menu, scroll down and click on Network Troubleshooter in the right pane. Allow your computer to diagnose and fix connectivity problems on your computer. The next step is to run Network Troubleshooting Commands, in order to Reset the TCP/IP Stack, Release IP address, Renew IP Address and to Flush and Reset the DNS client resolver cache. 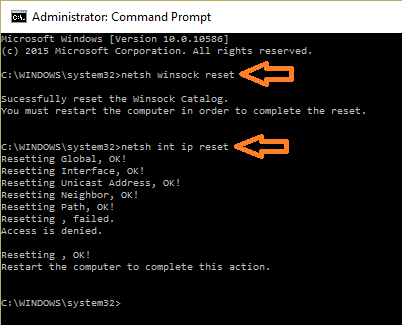 Right-click on Start button and click on Command Prompt (Admin) in the menu that appears. 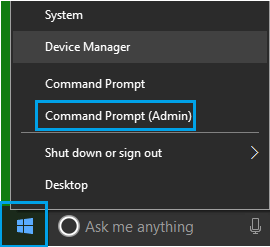 In the Command Prompt window, type the following commands (in the same order) and hit the enter key after each of these commands. Note: There needs to be a space after ipconfig in commands 3, 4 and 5 above. Once the above commands have been executed, type Exit and hit the enter Key to get out of the Command Prompt window. Restart your computer for the changes to take affect and see if the problem of Err Network Changed Error in Chrome is now fixed on your computer. Sometimes Network profiles can get corrupted and cause network connectivity problems. 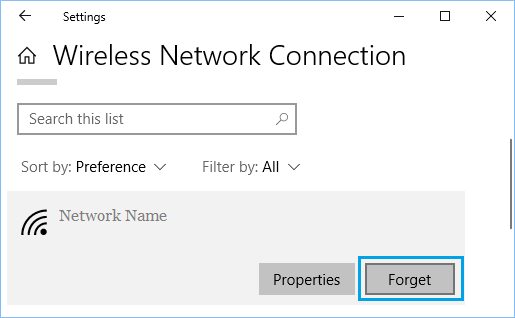 This can be fixed by making your computer forget the Network and joining the Network back again. Before following these steps, make sure that you write down your “WiFi Network Name” and “Password” – you will need these to rejoin the network. Click on the Start button > Settings > Network & Internet. 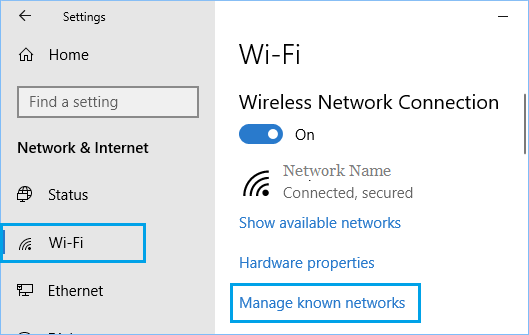 On the next screen, click on Wi-Fi in the side-menu and click on Manage Known Networks option in the right-pane. On the next screen, click on your WiFi Network and click on the Forget button. After forgetting the Network, rejoin your WiFi Network again and see if you are able to access the same website that you were trying to access. Right-click on the Start button > Settings Icon. 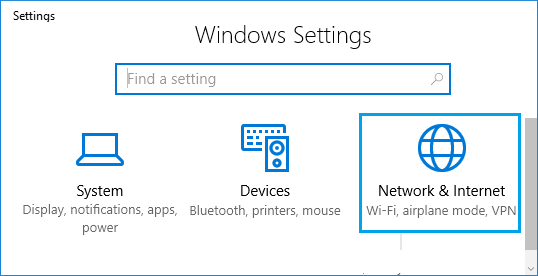 On the settings screen, click on Network and Internet option. 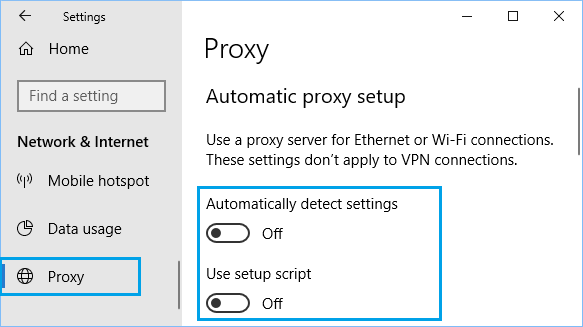 On the next screen, click on Proxy in the side menu and disable the option for Automatically detect settings under Automatic Proxy Setup. On the same screen, scroll down and disable Use a Proxy server option under manual proxy section. Windows should automatically update the network software on your computer. However, sometimes this may not happen, resulting in network connectivity problems. Right Click on the Start button and click on Device Manager option in the menu that appears. Tip: In case you see too many entries, look for something that says Network or 802.11b or has WiFi in it. 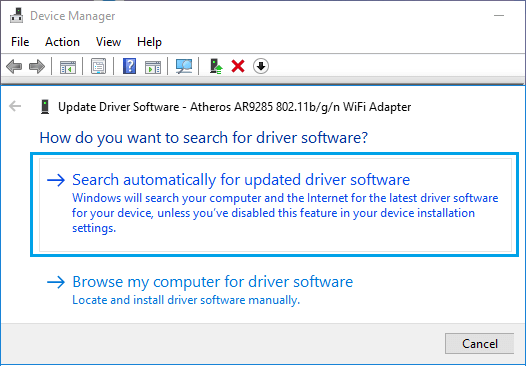 On the next screen, click on Search Automatically for Updated Driver Software. 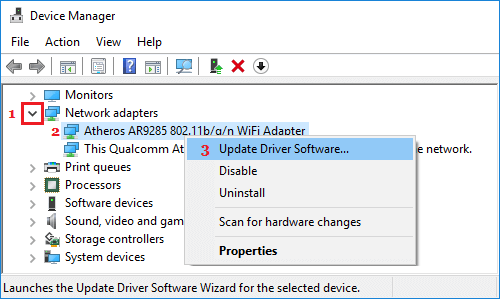 Your Computer will start searching for the Latest Driver Software for the WiFi Adapter on your computer. It will either inform you that your computer already has the latest Driver Software installed or come up with the Latest Driver software that you can install. If you are frequently dealing with Err Network Changed Error in Chrome and other network connectivity issues, you can consider consider switching from DNS servers of your service provider to Google’s fast and free DNS service.